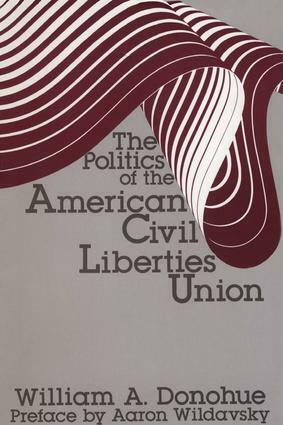 This is a critical analysis of the history of the American Civil Liberties Union and at the same time the history of American liberalism in the twentieth century. It represents the first published account of the ACLU's record. Other works on the organization either dealt only with specific issues or have been simply journalistic accounts. Donohue provides the first systematic analysis by a social scientist.This book is directed at those interested in the history of American liberalism and, no less, the history of American conservatism, for ideological struggle within the United States touches directly on civil libertarian concerns. The work is especially significant for American constitutional lawyers, political scientists, and for those concerned with serious ideas in American life. Supporters as well as critics of the ACLU will be attracted to this work for different reasons. It is unquestionably the most serious work now available and is likely to remain the touchstone for any such work for many years to come.